CHICAGO – There are few civil rights events shrouded in mystery like the Stonewall Inn Riots – a June night in 1969 in New York City, when gay liberation was born. Witnesses and participants in the riots have grown exponentially over the years (“I was there.”) and the who, what and how the riots began have also been in dispute as time goes by. All of that perspective is realized in Ike Holter’s incendiary stage play “Hit the Wall,” presented by the Chicago Commercial Collective at the Greenhouse Theater in Chicago. “Hit the Wall” began its life at Steppenwolf Theatre’s Garage Rep in 2012, and had a successful run Off Broadway in New York City last year. 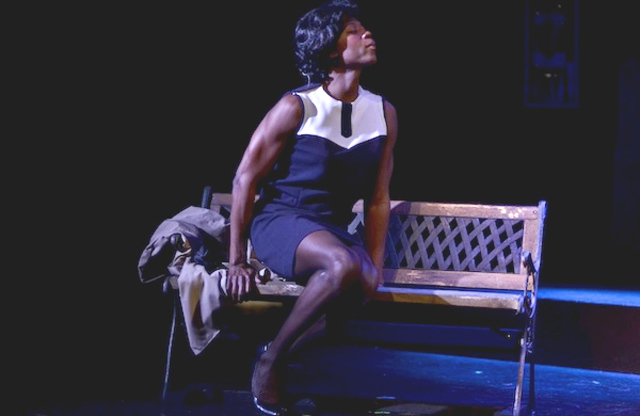 A majority of the original cast is back for this revival, as director Eric Hoff takes Holter’s plsy and builds stage craft that feels like the revolution that began on June 28th, 1969. The Stonewall Inn was a mafia owned gay bar that treated their customers like dirt, and allowed regular raids to take place from “vice squad” police officers. On the night of June 28th, a police raid led to a riot, as patrons of the Stonewall and fellow travelers from Greenwich Village fought back against the longtime marginalizing of gay men and women. Holter’s play sets up some preliminaries to the main event, as the men and women involved at Stonewall are on a collision course that will result in their own sense of freedom. 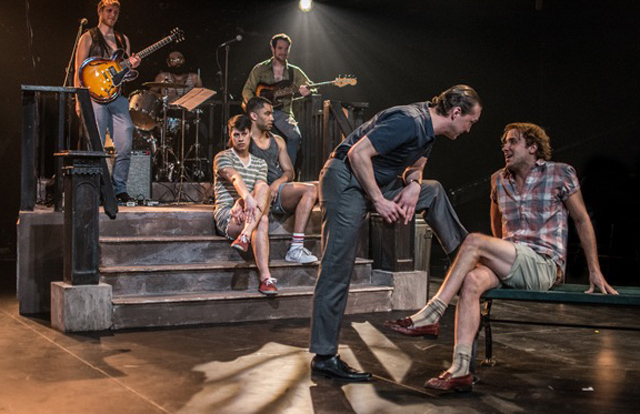 In true historic fashion, Holter places his diverse cast of characters on that day (June 27th to the early hours of the 28th) as “I was there” participants, all representing an element of the impending gay liberation. There are Greenwich village stoop dwellers Tano (Steve Casillas) and Mika (Desmond Gray) – the Greek Chorus of the proceedings – plus cross dresser Carson (Manny Buckley), a Newbie to the Stonewall (Daniel Desmarais), a lesbian outlier named Peg (Sara Kerastas) and radical Roberta (Shannon Matesky), as well as social authorities represented by Peg’s sister Madeline (Mary Williamson) and a New York police officer (Walter Briggs). All these characters clash within the confines of the Stonewall Inn and the streets surrounding the tavern. The dialogue is a mixed bag of Holter’s street prose poetry, misunderstandings, romance and mouthpieces of change. The characters count down the hours to the riots, as the temperature symbolically rises. In the backdrop, there is the funeral of Judy Garland, whose status as a gay icon is particularly moving for cross dresser Carson. All the anger and frustration is ardently and achingly delivered by the energetic cast, they are truly reliving a happenstance that – by the strength of their performances – is obviously near to their hearts. The staging is vital and amazing as well. At the top of the stoop that Tino and Mika hang out on, is a three piece rock group mining the searing guitar riffs of the era (they warm up the audience beforehand with 1969 hits). Their presence brings such an urgency to the onstage action, and in fact the three oversee it all as if they exist as messengers. This is willfully interactive with the events of the day and the eventual riots and adds a gut punch that really is effective. Stand outs in the cast include Manny Buckley, who brings an appropriate poignancy and anger to Carson, including a reveal of huge biceps that could obviously fight back, but chooses otherwise. Walter Briggs brings a lethal authoritarianism to the cop character, creating a wrongness that almost can never be forgiven. And Sara Kerastas imbues Peg with the confusion of the era, caught between the two worlds of the life forward and the one left behind. The Stonewall Inn riots are one of the greatest and most symbolic of the struggle for change in American culture – through the AIDS era and right up to gay marriage legalization. The next time you go to the gay pride parade in Chicago, or any city, consider the sacrifice of a few brave souls on a hot summer night in New York City, finally pushing back against an oppressive social order. “Hit the Wall” is presented by the Chicago Commercial Collective at The Greenhouse Theater, 2257 N. Lincoln Avenue, Chicago – Thursday-Sunday through May 25th, 2014. Click here for more information and to purchase tickets. Featuring Manny Buckley, Steve Castillas, Sara Kerastas, Shannon Matesky, Walter Briggs, Daniel Desmarais, Desmond Gray and Mary Williamson. Written by Ike Holter. Directed by Eric Hoff.